Travelling in Germany can be a frustrating experience for vegetarians. While you won’t be considered mentally ill like in neighbouring France, in many places the menu is still organized by type of dead animal (beef, pork, poultry, etc.) and ironically, you may even have a hard time finding a vegetarian salad. Fortunately, you won’t have to go hungry when visiting what might be Germany’s cutest city. Choice of 8 vegetarian main dishes plus side dishes. Certainly worth the trip from the Altstadt (take the bus or tram to “Betriebshof” if you don’t want to walk). Expensive for German standards but absolutely delicious. No pictures because I was enjoying the food too much (yeah, I forgot to take my camera). 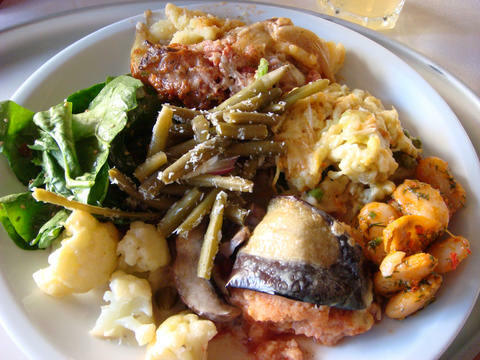 A vegetarian’s dream: an organic vegetarian buffet with lots of cold and some warm dishes. There’s also a daily changing option which is made on demand if you’re not a fan of buffets. Don’t wait for the waiter, it’s a self-service restaurant. 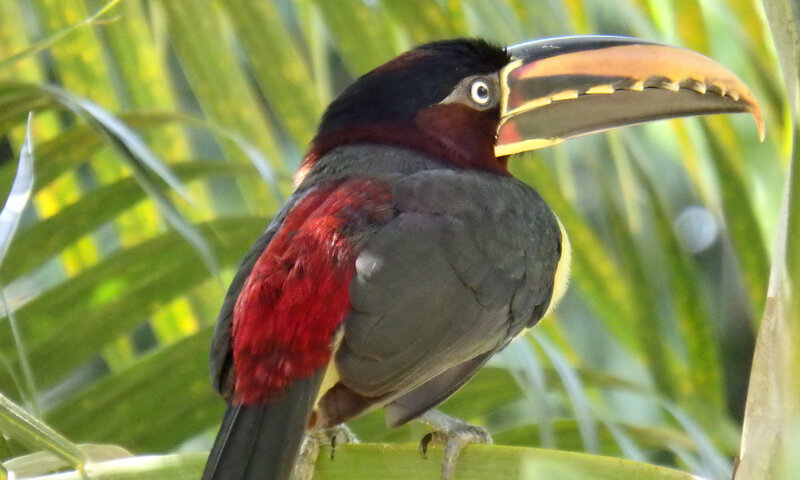 You pay by weight (the food’s, not yours), so don’t go crazy if you’re on a budget. Lovely small Sushi place close to the Alte Brücke. 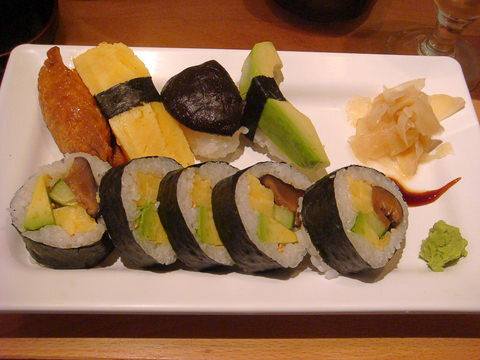 Vegetarians can choose between delicious Sushi with avocado, omelette, shiitake, cucumber and tofu. Try the Japanese Kirin beer which is brewed in Germany’s oldest brewery for the European market. Serves breakfast until 4pm on Sundays and public holidays, which I believe should be the norm everywhere. 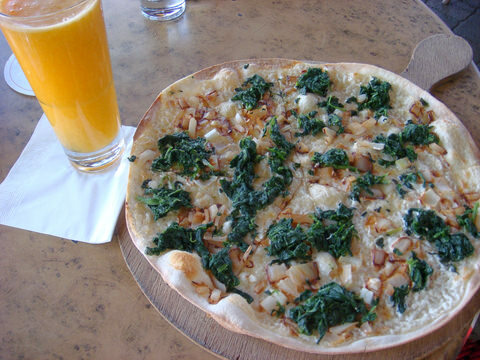 I tried the Flammkuchen “El Vegetariano” (pictured above) which was very good. Really nice outdoor Biergarten in the shadow of a huge tree (with view of the river, some traffic noise, though). 4 vegetarian main courses, I tried no. 41 (fried noodles) which was good and no. 33 (Ramen) which was a disappointment: lukewarm soup, noodles still stuck together and raw bean sprouts on top because to Germans, nothing says “Japanese” like bean sprouts. MoshMosh is the only place on this list I wouldn’t visit again (which is a shame, because Ramen can be so delicious when done right). BTW, my wife thinks I’m being too kind, she rated no. 41 as “just OK” and no. 33 as “really bad”. Despite doing a lot of walking and foregoing breakfast I did not manage to eat at more restaurants during my 3 days in Heidelberg (I must admit that I went to “red” and SameSame Sushi twice). There are more, tough, have a look at Happycow.net or just walk through Heidelberg and check out the menus. Don’t hesitate to post your recommendations and experiences in the comments!